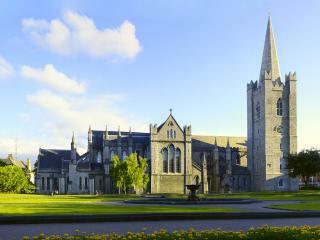 Located on the east coast of Ireland, Dublin is a popular holiday destination in Ireland and is also the country’s capital. Renowned for its vibrant nightlife and famous tourist attractions, Dublin is a particularly popular tourist hub in summer. From its famous Book of Kells to Dublin Castle and St Patrick’s Cathedral, there is much to see and do in Dublin. Offering a wide range of Dublin accommodation options to cater for the large number of tourists who visit, the city is also home to highlights such as the Guinness Storehouse, National Museum of Ireland, Dublin Zoo and Botanic Gardens. Visitors to Dublin should also not miss the nearby ancient site of Newgrange. As the most popular entry point for visitors to Ireland, Dublin accommodation can be found throughout the city and its surrounds, catering for the many tourists who holiday here each year. Offering everything from budget accommodation options to mid-range and even luxury hotel stays, Dublin accommodation is conveniently located close to the city’s most popular shopping, dining, nightlife, activities and attractions. With the city most easily navigated on foot, no matter which Dublin accommodation you choose, you’ll always be within a short stroll of everything you need. View Dublin Hotel Map.